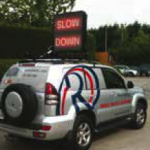 The Rennicks Vehicle Mounted Variable Message Signs (VMS) are an extremely flexible way of conveying advance traffic information. • The sign is lightweight, compact and easily programmed via a wired handheld controller. • The LED’s are high output and have a low power consumption. The sign casing is aluminium. • The automatic brightness setting facilitates legibility day and night in all weather conditions. • The sign has an IP 66 and EM / CE certification.